Summer is right around the corner so why not celebrate now by giving your laundry a fun and exciting tropical scent! When I first poured the Tropical Splash Purex detergent into my washer I was impressed with both the neon-looking color and the tropical smell! This detergent is part of the Purex Brand Natural Elements line! This particular fragrance is scented with exotic fruits like pineapple and coconut! It can deliver bright, white and clean laundry with the power of naturally sourced ingredients! The detergent works in all types of washers including High Efficiency. 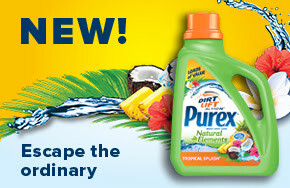 Enter the Rafflecopter Below to WIN your own 3 Bottles of Purex Natural Elements!!!! Disclaimer: Purex Brand Provided me with a sample of Purex Natural Elements Tropical Splash detergent in exchange for a product review. However, all the opinions expressed here are my own.